The Pz.Kpfw. Maus is a Rank V German heavy tank with a battle rating of 8.0 (AB) and 7.7 (RB/SB). It was introduced in Update 1.47 "Big Guns". The Maus is the definitive tank of heavy armour in Rank V and is one of the largest tanks in-game, if not the largest. The Maus can be a menace in the battlefield and conversely also a bullet magnet, a double-edged sword that must be played correctly or else fall victim to heavy enemy fire. The "Maus" lives up to its reputation as mobile bunker. The dual guns do great damage, however against high rank tanks it is best to use the 128 mm main gun. It is important to protect the back armour on the Maus and to make sure it does not get out flanked. Preferable used at long range and choke points. Best used as an armoured beast able to destroy vehicles and take any shot. Speed on the vehicle is roughly 20 kph. The sheer mass of the vehicle and its speed makes the mobility difference from road to off-road negligible. The vehicle can actually turn pretty fast once at Gear 6, which is better than the Jagdtiger and some other Rank V heavy counterparts. Keep that in mind and use it as advantage in CQC. The 128 mm is a great gun in-game, very accurate and perfect for mid to long range engagements. The reload is very good too for its caliber (23 sec stock) that is a big advantage versus IS-4s, because the Maus has three seconds for an extra shot. KwK44 has the best penetration value of any APHE shell ingame. However, the APCR and HEAT shells of the T-54 and late US vehicles surpasses it. Damage wise the 128mm PzGr.43 is equivalent to the 122mm BR-471 of the D-25T, where penetration usually means a knock-out. Coaxial LMG? Pff, that's for normal tanks (But it is there anyway). On the Maus everything is bigger. The short 75 mounted alongside the main 128 originally served as anti-infantry and soft target weapon of choice. 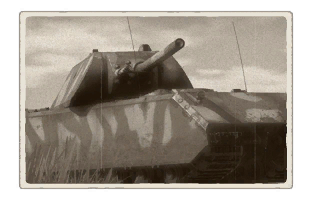 In War Thunder this vehicle types are either not found on the battlefield or as latter only on certain maps. It comes without question that the 75mm should be used against AAA, trucks and SPAA. 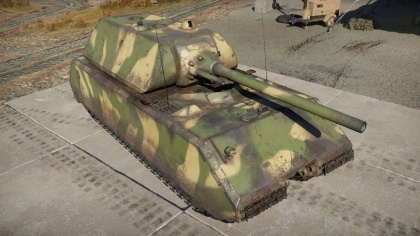 However, the HEAT shell can be used to harass the enemy, lure them out/in of cover, or just damage medium tank's sides (T-54 and M46 do not exceed 80mm of armour) and tracks. In addition the secondary cannon has a good reload rate of around 5 sec, thus it can be used to defeat light tanks and SPAA without wasting the precious 128 mm ammo for more heavily armoured targets. Ammo racks for the Maus. Versus heavy tanks the Maus has all the advantages. While slower it can make up for this in close combat thanks to the good turn rate of both tracks and turret. Just quickly angle the Maus (both turret and hull!) and turn it invincible. Try angling the front drive wheel at the enemy tank and turn the turret so that the armour is at ~45 degrees to then enemy fire. The only threat are other high-calibre tanks like the M103, but the M103's HEAT is limited in damage potential due the big empty spaces inside the tank. Versus medium tanks the Panzerkampfwagen VIII can fight in close combat (CQC) with its great turret rotation speed, but at the cost of exposing the side armour and getting flanked, this should be kept as one's last and or only option. Distance is the ally of the Maus, which should be easy to do considering that the topspeed is 20kph. This monster of a tank started development in 1942 on the suggestion of Ferdinand Porsche to Hitler, which was approved. The first prototype was to be completed by 1943 and the project vehicle was designated the Mammut (Mammoth). The name changed in December 1942 to Mäuschen (Little Mouse), then once more to the Maus (Mouse) in February 1943, which stayed as its designation (and perhaps proving that Germany does have a sense of humor). The prototype used Ferdinand's "electric transmission" that was previously used on the rejected Tiger(P), the vehicle would be powered by a MB 517 diesel engine. The Maus has a suspension design with 24 wheels on each side, 2 per bogie with two bogies side by side and six bogies lining up from front and back. The armour was perhaps the most defining feature at 220 mm thick at the hull front, the sides and rear were 190 mm thick. The turret was even thicker at 240 mm on the front and 200 mm on the sides and rear. The vehicle was to also have a 128 mm KwK 44 main gun with a 75 mm KwK 44 gun as a coaxial. The overwhelming design was approximated to weight 100 tons. The production plan was to have the prototype completed by mid-1943 and for 10 vehicles per month after the prototype delivery. Work would be divided between Krupp and Alkett for the production of the machine. The wooden model of the tank was presented on May 1943 to Hitler. It was then approved for production and 150 of them were to be built. With the final design finished, it was estimated to weight 188 tons now. Though Hitler and his peers saw it with much favor, Heinz Guderian criticised the Maus design because there was a lack of machine guns, thus it was extremely vulnerable to infantry attacks at close-quarters for the same reason as the Ferdinand tank destroyer. The anti-infantry problem was solved with the addition of a coaxial machine gun and a Nahverteidigungswaffe dischargers, firing smoke or high-explosive shells in its surrounding area, installed on the turret. Two prototypes of the Maus were made in 1943 and 1944. The first one, called V1 was turretless and assembled by Alkett in December 1943, it was fitted with a mock turret that helped finalise the turret design in 1944. Here they determine the Maus was definitely too heavy for any bridges in existence so the Maus would ford rivers with a snorkel. The second prototype called V2 by Alkett again had the first produced Maus turret attached with the 128 mm gun, coaxial 75 mm gun, and coaxial machine gun. In July 1944, Krupp was producing four more hulls, but these were scrapped and the whole project stopped on August 1944, though tests with the V2 continued. The weight of the tank meant that the power-to-weight ratio was extremely poor, resulting in the Maus' ideal speed of about 8 miles per hour maximum in ideal conditions. However by 1944, the Red Army was advancing deeper and deeper into what was previously German-controlled territory. The vision that the Red Army might capture the testing grounds of the Maus prototypes and the prototypes themselves seem to come closer to reality. The Germans were forced to destroy the prototypes to prevent their capture by the Soviets, placing charges onto the V2 prototype (the V1 was only a hull so it wasn't combat-effective). The second prototype had the entire hull damaged as there was ammunition still in the tank when the charges went off, but the turret was mostly intact. The Russians captured the damaged prototypes and held them until the end of the war. After World War II, the Soviet Commander of Armoured and Mechanized troops ordered for the V1 hull to be attached with the turret from the V2 prototype. They had to use six Sd.Kfz. 9, the largest half-track vehicles produced by Germany, to move the 55 ton turret to the hull. The fixed prototype was sent back to the Soviet Union for testing and arrive on May 4, 1946. Once this is done, the prototype was sent to Kubinka Tank museum where it lays today on display for the public. This page was last edited on 11 January 2019, at 22:09.